and I'm here to help you learn how to knit. Perhaps you have some knitting questions? What's the best way to learn to knit? Which knitting needles should I use? After all there’s so much knitting information out there today it can get really confusing. That's why I built this site, to help you sift through it all and build a good, solid understanding so you can become a fabulous knitter. That's what Simple-Knitting is all about, learning how to knit and understanding the knitting basics too. Wondering where to get helpful knitting information? How to start knitting? What do you need to begin knitting? When I learned how to knit they didn't have too many choices in knitting needles but today you can choose from wooden, aluminum, bamboo, plastic, straight, circular, double pointed and interchangeable. Boy there's such a variety of needles that it can be very confusing for a new knitter. Then there's an incredible number of yarn types to choose from for knitters, each ball of yarn having its own special qualities. For beginning knitters it can be quite overwhelming, I still get overwhelmed, haha. But there is help for beginning knitters. 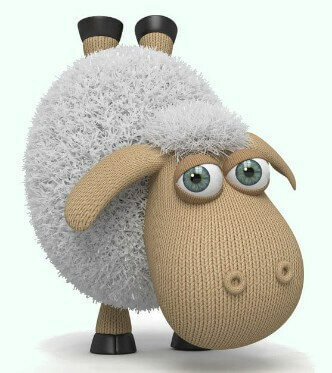 You'll find lots of help for beginning knitters on my beginning knitting page. It will help you get started and show you what you need to start knitting, including how to choose your yarn and needles plus much more like reading yarn labels and holding your needles and yarn. Want to check out some of my knitting stitch patterns that you'll be able to try very soon? Once you feel comfortable with knitting and purling you'll be able to try out some knit and purl knitting stitch patterns I created. It'll be great practice and you can have some fun knitting them. There's all kinds of stitch patterns for you to knit. One of my latest favorites is this stitch pattern here. 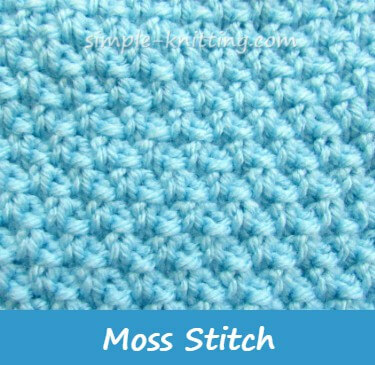 It's call Moss stitch. Pretty isn't it? And very easy to knit. Casting on: this shows you how to put stitches on your knitting needle. You just choose which cast on method you like the best. Bind Off: Learn how to take the stitches off your needle securely when you are finished knitting. Practice knitting those for awhile and then you can simply move on to the other knitting lessons as you develop your knitting skills. Take your time and just have fun knitting. You'll get it. Besides learning to knit, you'll find other helpful resources as well such as knitting tips and even tips for beginners. I want to make sure you get started knitting as quickly and as simply as possible so you'll discover how much fun knitting can be. Knitting is supposed to be fun. Don't take it too seriously. Have fun knitting, try new things and don't be afraid to experiment. "In the rhythm of the needles, there is music for the soul." - Anonymous.